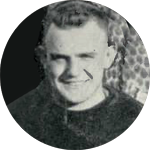 Perhaps because he had played on several teams at the U of I with both George Halas and Dutch Sternaman, Ingwersen was recruited to come work for Staleys in the “Table House” and play on the 1920 football team. He started and played in 12 of the 13 games that season. In addition to his regular salary for working in the Staley plant, he made more than $1600 for his football work. In 1921 he went back to the University of Illinois and coached the freshmen football team as well as coaching some baseball before becoming Zuppke’s assistant. On September 1, 1924 he married Edith Kohl of Centralia, Illinois. Mr. Ingwersen has been Mr. Zuppke’s brightest pupil and his assistant for four years. He has scouted every team in the conference. He knows the style and system of play of every conference team. He knows the strength and weakness of every conference player. He has made a reputation at Illinois as a coach, as a teacher of subjects in physical education, and as a square, clean fellow. A month later he signed on as assistant football coach at Louisiana State University in Baton Rouge, Louisiana at a salary of $7,500. After three years at LSU he became an assistant coach at Northwestern University in Evanston, Illinois in 1935. On February 11, 1943 he was sworn in to the U. S. Naval Reserve and served as a Lt. Commander and the athletic director at the pre-flight school at Chapel Hill, North Carolina. Within days of being released from the service in September 1945 he reunited with his old Staley teammate Leo Johnson as an assistant football coach at the University of Illinois. Ingwersen was using a cane to get on and off the Illini field when he reached the then mandatory retirement age of 68 in August 1966. Three years later he had a heart attack and died in Urbana at the age of 71. During his 20 years back at the University of Illinois he spoke at dozens of sports banquets all over his adopted state. He is buried in the Elmwood Cemetery in Centralia, Illinois. His nephew is well-known portrait artist James Jay Ingwersen of Door County, Wisconsin.